I bought four cubic yards of Black Forest mulch from St. Louis Composting for a total delivered price of $155. It’s a combination of fine wood mulch and compost. It’s a very nice mix that looks great. It’s easy to spread, but took a week for me to put it all down. I really could have used five yards. Unfortunately, the mixture was still very hot and burned the lawn in the center. I’m hoping that the grass will come back. Next year pay Linda to spread the compost when she cleans the garden. Composting is done mainly in Belleville’s unit. Takes 180 days to make mulch from bags to finished product. 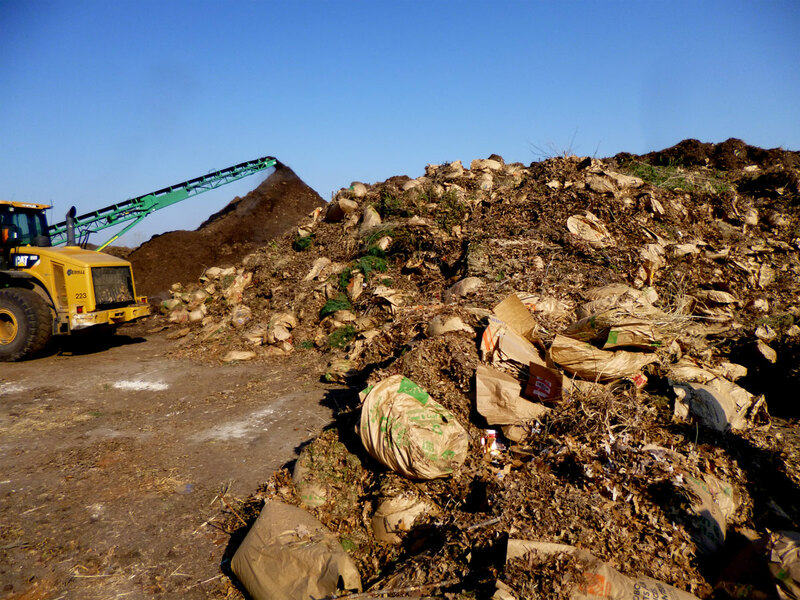 Black Gold is all compost – includes food products. I could use this for mulch. From bags to compost, it loses 2/3 of it’s volume. Leaf mulch are just chopped up leaves – use for perennials – not composted. Black Forest – mulch and compost – what I like for a mulch. Forest fines – double ground mulch with compost added. Mo Bot Garden Compost is Black Gold compost – note the bagged product is much more expensive than the bulk. Dye they use is Colorbiotics. Hatite is a rock which is heated and expanded and has a lot of micro pore space. IDEA …..could I use hatite instead of charcoal? Mercy hospital has a huge courtyard in between the buildings which has this material. They may call it their healing or meditation garden. They do a lot of growing mixes. Get 550 tons per week that they add to the compost. He says this is just a small amount of what is generated. He estimates this is less than 1% of the actual waste. USDA says we waste 30-40% of the food produced. Problem with dog waste in plastic bags that people put in yard waste. Plastic doesn’t decompose! They water their compost to help the process. Core aerate seed etc. Then spread compost over the top. In St. Louis, these companies do this. You can use Black Gold – It’s a little larger in size. Let it set for a week and then use a mulching mower to go over it. They make a finer compost than the black gold. It’s the same only smaller size particles. It’s called Field and Turf Enhancer. Synthetic Fertilizer are basically salts and if you keep adding salts to the soil,you’re beginning to kill off the microbial action. Study at Harvard – added compost to lawn? When you get the organic matter in the 5-10% range,then the microbes will take nitrogen out of the air and fix it into the soil. This is the same as adding 50 pounds of nitrogen per acre. If you’d like to save a few dollars on mulch, you can bag your own over by 8015 Dale Ave – 63117. It’s a self-serve facility that has old ground up leaves that should work well for most people. They won’t look quite as nice as the picture above, but will save you quite a bit of money. If you can get a friend with a pickup truck the job will be much easier. I’ve been told you don’t need to be a resident – it’s open to anyone. Today I attend a program done by three experts in the St. Louis gardening community. Below are my notes from their presentations. Does not use fertilizer on the beds at Meramec CC. Earthworms are good. He even likes moles as they aerate the soil. Uses tree chips from aroborists every two years as a mulch. He does not incorporate organic matter into the soil. He tells of one instance when a person actually had too much organic matter in the soil – 20%. Recommends chicken manure as a fertilizer if you need fertilizer. Available at Hummerts. A lot of soil in the St. Louis area is 1% to 2 % organic matter. Build organic matter to 5% . In general, he doesn’t like tilling except in some very new gardens with poor soil. If your grass needs help in the fall – first aerate – then add 1/2″ Black Gold mulch. Rain gardens are 30″ deep. Compost has a PH of 9. Most plants like a PH of 6.5 to 7. My Conclusion – check you soil PH – every year. Leaf Mold is not true compost. You can use Iron sulfate to change PH quickly to more acid soil. He uses a soil mix of 2 parts compost, 2 parts pine bark fines, 1 part rice hulls and 4 pounds iron sulfate and 5 pounds gypsum/yard. for his new plants in the greenhouse. No Peat Moss. Plants seed to like it even though the scientific analysis says it shouldn’t be that good. You have to buy it in bulk, but could bring in 5 gallon buckets. He uses a water soluble fertilizer – 200 parts per million. Sand is for concrete – not soils. 2015 – I used 5 cubic yards of compost, Black Gold. When they dumped this, it covered an area 15 feet wide and 12 feet long. It was supposed to be screened to 3/8 inch, but I had some very large chunks in the mix.- I could have used at least 6 yards. I would wait until later in the year – say June 1 so that seedlings have time to emerge. I’d suggest going back to Black Forest Mulch in 2016. Note – October 19, 2015 – everything in the garden did VERY well and I did not fertilize anything in the garden. 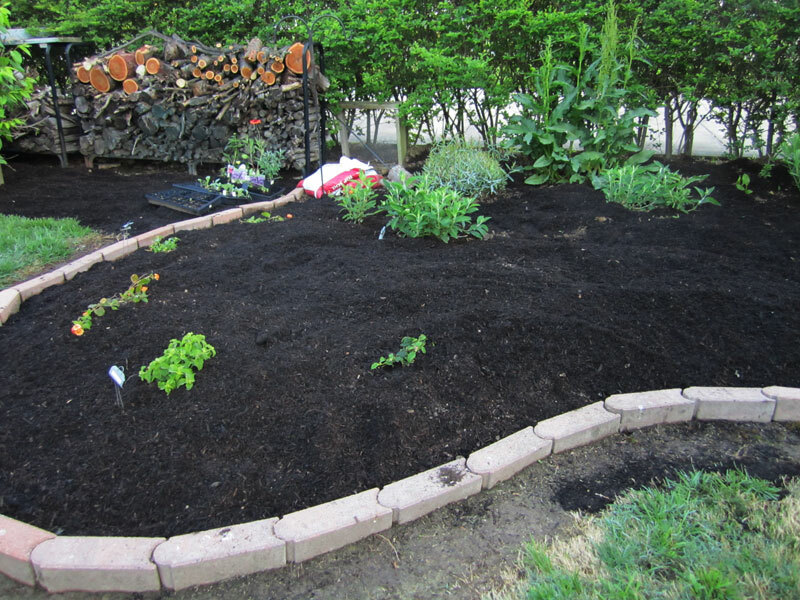 This year (April 7 -2012) I decided to use a product called “Black Forest Mulch” to cover my many gardens. It’s a mixture of finely ground wood mulch and “Black Gold” compost. It’s got a coffee grounds appearance, looks great and doesn’t smell as bad as some mulches. I bought it from St. Louis Composting. This year I used 4.5 cubic yards of mulch and could have used five. (This equals 122 cu. feet.) Our small truck which we borrowed from a friend holds 1.5 cubic yards per load, so it took us three trips to get it all. At $21/cu. yard the cost of the mulch with tax was $102.00 Note – it is now $22.00. If you compare that to buying it by the bag the savings are fantastic. At one garden center, 1.5 cu. ft sells for $5/bag. It would have taken me 80 bags to get all the mulch I needed at a cost of around $440 and 5 trips to the garden center. A standard full-size pickup will easily take two cu. yards or three yards if it is mounded up.I may consider having the mulch delivered to the house next year depending on the delivery cost. It costs $60 for delivery. Before I put on my mulch , I spread out my charcoal and fertilizer mixture, so the mulch went over that. The take-away is do your research and find out where your local composting service is in your area. 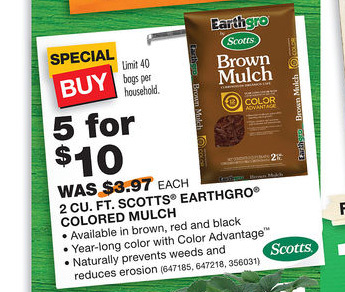 If you find a sale, you can buy mulch at a reasonable price at some big-box stores. At a cost of $1/cu foot, it would cost $122 + taxes. This is what we tried in a new kids garden area. At StLcompost.com, oak bark mulch cost $26/cu. yard. This would equal a cost of $117 plus taxes. If you’re just looking for plain mulch the on sale mulch might work for you. 2013 – July 20 – 3 cu yards Black Forest Mulch. I’m working with a couple of schools and they are asking about buying compost and mulch and how much to buy. Here’s what I figured out. So for 100 sq. ft. you would need a minimum of 1 cubic yard of compost and mulch for a 3 inch coverage. Another option I suggested with one school is to put 6″ to 9″ of Super Soil down over the existing soil after killing the grass and weeds. I have tried this on one part of my garden and it worked great. As you see below, if you only need a small amount of mulch or compost, the best deal is Home Depot, but it you need five or more cubic yards, it would be better to have St. Louis Composting deliver the mulch to your location. Of course you need to figure in your time and car expense to drive to Home Depot and pickup the mulch. I did something this week that I’ve never done before as a gardener. 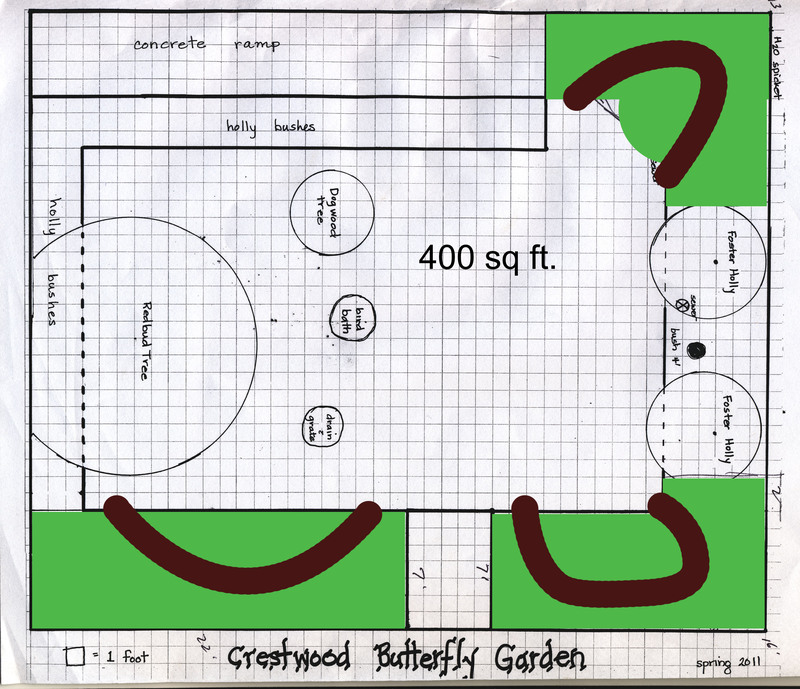 I started a butterfly garden and planted all my plants in 9″ of mulch. Now this is not something that I’d recommend or normally even try, but the “maintenance” people had dumped a whole pile of mulch in this one area, the previous fall. Even though we tried to move some of it, it was just too much of a job for the time we had. I loosened up the mulch so my little helpers, 15 Brownies, could plant and then we just made a hole in the mulch, put in our plant and filled in with Miracle Potting Soil. We top-dressed the entire area with the remaining soil. I’ll report in the fall how well this method works.